Access blocked websites, hide your IP address, surf anonymously without a trace on the Internet, bypass websites country restriction such as bbc iplayer, on YouTube (this Video Is Not Available In Your Country). Proxy Mask provides two options. 1- ) Proxy Switcher: check and connect to Internet through proxy server. 2- ) TOR anonymous Network:You can connect to the Internet through TOR anonymous Network with any web browsers. 1- ) Proxy checker and switcher: Every week on Sunday proxy list automatically updated with new and working proxies, also you can add IP:port proxy list from clipboard or from file. You can check and test 20 proxies parallelly. You can filter out proxy by type (HTTP, HTTPS), by country, by anonymity level (anonymous, transparent, elite) and sort proxies by type, by ip address, by uptime etc. You can define a proxy for all applications that use system proxy settings or you can use multiple proxies with different processes or web browsers at the same time. E.g. one for Firefox, another one for Chrome, in this way you can have two different IP addresses with two different web browser at the same time. Proxy Test Modes: Rapid, normal and Full test. Rapid: only checks whether proxy server is up or down (very fast), Normal: Checks websites connectivity through proxy server. Users can also enter a website URL to check connectivity through proxy to desired website, Full: Checks proxy anonymity type such as elite (high anonymous), anonymous and transparent proxy. 2- ) TOR anonymous Network: You can connect to the Internet through TOR anonymous Network with any web browsers (IE, Chrome, Firefox etc.). You can choose multiple countries to get an available IP address and start surfing anonymously. March 8, 2016 Internet, Online Privacy, SoftwarePopNet Media LLC. Surf anonymously, prevent hackers from acquiring your IP address, send anonymous email, and encrypt your Internet connection. Protect your online privacy by changing your IP with IPinator – VPN. When you browse the Internet normally, your computer makes a direct connection to the websites you visit. With IPinator VPN running, an anonymous proxy server is set to relay information between you and the websites you visit, hence web sites see the fake relay IP and not your real IP address. Where are these fake IP addresses located? 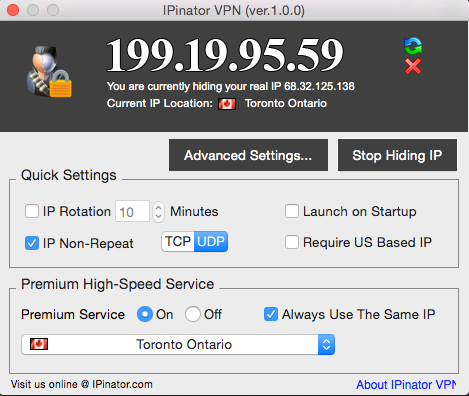 IPinator VPN selects a random IP from a list of hundreds of anonymous fake IPs from all over the world. The chosen IP is then automatically installed into your web browser, e-mail client, game, or other application you specify IPinator VPN to work with, allowing you to surf the Internet and use Internet-based software while remaining totally anonymous. Never interfere with user’s normal navigation. PopUp Sweeper will enable you to close those annoying pop-up windows and enhance your Web surfing experience! There is no need to configure the program and you won’t need to learn how to use it. Simply download and launch it. PopUp Sweeper includes an IE Toolbox which is an extremely useful tool for customising your Internet Explorer. PopUp Sweeper will close the annoying pop-up windows,It toggles on and off quickly and easily.Get rid of annoying pop-up windows and enhance your Web surf experience!It needn’t configure, needn’t learn how to use, simply download and launch it, that is all! Starkit is the ONLY Self-booting software package that installs on any computer within minutes and includes every component you need to get back your privacy. It is a high performance software appliance with a secure built-in Mail Server and Cloud storage software.